Uh oh! You spent too much time eating lettuce and cannot now win the race. But speed alone cannot win the game. As in the story of the hare and tortoise, a player cannot win as the hare or the tortoise, but must balance the speed and patience of each to win the race. Thus, skill and cleverness are more important than luck in this race. Of course, luck may help, but you cannot rely on luck to win the game. 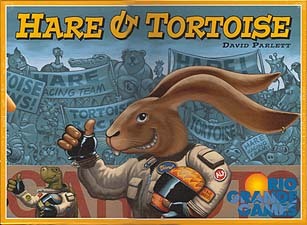 In 1979, Hare and Tortoise was chosen as the first "Spiel des Jahres" winner. Even today, it remains a unique and popular family game. Like Wizball says, this game is a classic. My copy is years old, from when the game was being printed by Gibson Games. We still get it out for a game now and again. The progression around the board lies in mathematics. I once played this with a mathematician and thought i was winning for two thirds of the game as he was way back when all of a sudden he cam from nowhere and not only caught up with me but overtook me and won by a comfortable margin! But that didn't stop me from playing this little gem, in fact thats why I bought it after playing him! How do you review a game that has been around for so long, been produced by several different companies yet still remains one of the classic all time games. The only way is to be honest This is a Great Family Game, it is also good gamers game due to all the stratergy. Every time you play this game a new strategy should be apparent as a way of winning this game, this is due to the nice way that movement is controlled. To move foward you use carrots and to gain them you move back. You can also gain carrots in other ways such as being on the right square at the right time. But be careful as you may have too many carrots to win at the end of the game. This means that it is a balancing act between gain carrots and using them up. This allows for different strategies even within the same game as the game progresses. Now this might sound like the game is not what I claim, and what it claims to be, a family game, but it is as you do not have to do too much thinking to play the game and you can still enjoy it. I highly recommed this game for anyone that is looking for a family game to play. I also recommend it for gamers that are looking for a light fun game to play with enough depth to keep them interested.